The Klein Karoo Cooperative (KKLK) originally set the standards for ostrich skins as the only suppliers of the product, these standards set in an environment of strict control of supply. The opening up of the industry in the early 1990’s resulted in greatly increased numbers of slaughter birds around the world, with the numbers in South Africa doubling in a very short period. Instead of matching this increase in slaughter with the development of new markets, the new entrants chose to sell into the existing markets. This turned a seller’s market, with excessively high prices achieved by limiting supplies, into a buyer’s market with many new players selling skins to the same limited number of buyers. NOPSA (National Ostrich Processors South Africa) set some basic grading to provide a basis for pricing of both selling price as well as the price paid to the producer. Grading skins in crust gives producers the best price. The downside of this is the delay in payment to the producers. During the development of our industry many producers export their skins to tanneries in a different country and often via traders who provide a consolidation service to achieve economically viable shipments. In this situation it is necessary to have a payment system to enable payment to producers prior to shipment. A good grading system is necessary to provide incentive to farmers to produce good skins and for the sellers of finished skins to optimise prices. At current prices, the difference in value of a grade 1 and a grade 4 skin can be equivalent to the total feed costs of a slaughter bird, so there is every benefit for producers to take care of skin quality. Scars and blemishes currently form the basis for grading with further penalties for poorly developed follicles and skins deemed too small. Definitions of acceptable follicle size and style are vague and often simply a subjective opinion of the tanner or buyer. 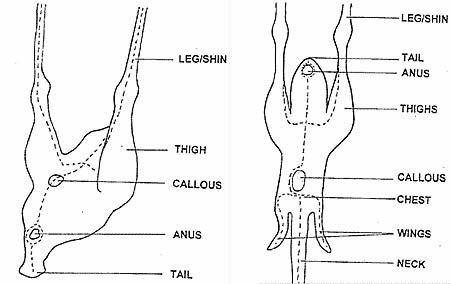 Markets vary in their requirements so clearly defined classifications need developing to suit different uses; classifications based on things like follicle size, skin size, thickness, whether a mature skin from a cull breeder or from a prime slaughter bird. Tanneries report significant variations in quality of skins between farmers, with many having a poor structure that does not tan easily. With the same grading criterion applied to all classes, the price differential will be market driven and determined by the skill of the marketers to identify new markets and develop demand. The development of the classes will be an evolving process. A grading standard for finished and crust ostrich leather will reflect its cutting value. It further assists buyers to purchase the quality of leather that is required for the manufacture of a specific product. Grading is required to set producer payment as well as finished leather prices. Note: 1 and 2 use same standards. The following are the general definitions for all grading systems. The crown is the area with quill markings on the skin, excluding the neck area down to the wing folds as well as the flank areas. Defects occur in various sizes with three sizes (circular) defined, namely 40, 80 and 120 mm in diameter. A scar is any defect that disturbs the natural grain pattern. Scratches are the same as a scar and caused by sharp-edged objects like thorns. A rough surface is open grain damage normally associated with scuffing and is not the same as sueding caused by bacterial decay. Wrinkles on the crown area are a defect if obvious. In general, all defects or blemishes, regardless of size or whether open or healed, will be taken in account for grading purposes as they do influence the value to the customer. A healed wound that blends in with the surrounding natural grain pattern and is no larger than the distance between two quills is not a defect for grading purposes (it will not be prominent and is normally not the result of a large, deep wound). Bacterial decay causes Pinholes (not hair follicles), and an extensive occurrence in at least two (or more) quarters will result in a down-grade of at least one grade. A torn skin is a skin where the tear extends into the crown. This skin will be down-graded by one grade. Figure 1 shows the skin removed from the bird and the shape it should be. Figure 2 shows the cutting lines on the bird. 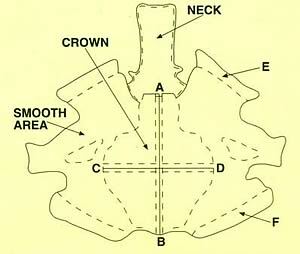 The length of the upper flank “E” on the diagram - Figure 1 and the length of the lower flank “F” on the diagram must be equal. If the difference is obvious and affects the cutting value, it will be reason for a down-grade by one grade. This will apply to wrong opening lines in general. The occurrence of hair roots causes hair follicles, is natural and believed genetic in origin. An extensive occurrence of it in at least two (or more) quarters of the quill area will be a reason for a down-grade by one grade. Vein marks are natural, but if they are obvious and cover a substantial area of the skin, it will be reason for a down-grade by one grade. A ripe feather, when harvested, will leave a full-bodied round quill; this is the ideal. Green feather quills tend to be opened/flat/prolonged. A sunken quill is the opposite of a green feather and is a quill with no body and a distinctive hole in the centre. Extensive occurrence of under-developed quills in more than two quarters will be reason for a down-grade by one grade. Trim the neck through the distinctive line where the quill area ends and the more non-distinctive smooth area on the neck starts. Trim the leg through the last distinctive line (10cm) above the middle of the knee. At least three quarters must be free from any defects. Permitted: Two defects in any of the three quarters if one is no larger than 80mm in diameter and one is no larger than 40 mm in diameter. Permitted: Three healed wounds no larger than the distance between four quills each on the crown area. The affected skin area should not be larger than 50% of the total skin area.